There are few things as humbling to experienced backpackers as barely making it a mile or so down the trail and finding yourself completely soaked from the knees down. Especially when the reason you are soaked was entirely avoidable. 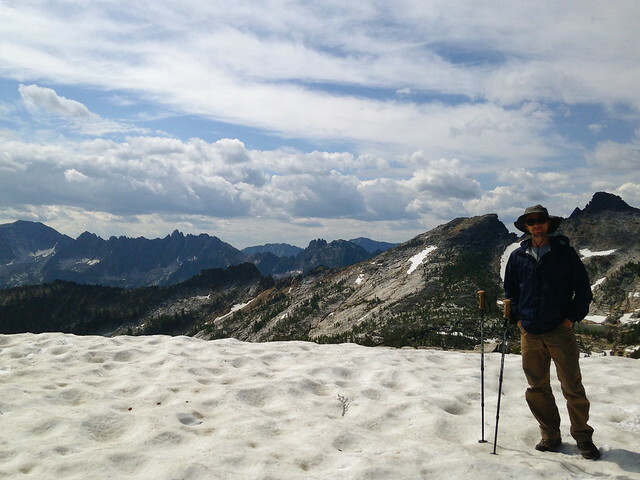 After several years of backpacking I suppose I’d become a bit complacent, or maybe I was just excited to be on another backpacking with my friend Justin; regardless of the cause I was wringing water out of my socks one mile into a six-mile hike. It was a perfect example of a few ounces of cure (i.e. rain pants) being worth a pound of cure. The trip started with frantic packing after a day of work as a late afternoon thunderstorm swept through. On the short drive south the skies turned sunny as the thunderstorm passed. By the time we were parked at the the small trailhead, the only other vehicle there making it seem almost crowded, the skies had reverted back to an uninspired and intimidating gray. A few drops of rain fell, but it didn’t seem to do be worth donning our rain gear for; we had our rain gear handy and could put it on when the situation really called for it. We were trying to balance the fine line between proactive and reactive. We failed. Perhaps the most insulting part of the whole experience was that we didn’t even get wet from the rain. We managed to stubbornly get ourselves soaking wet from the waist down solely from the vegetation that lined the trail. It was only after we had become thoroughly soaked that it started to rain enough for us to put on our rain gear and pack covers. At this point we were faced with a compelling wardrobe decision — should be put our rain pants on over our already soaked biking pants or just sacrifice our hiking pants to the wetness? We decided, correctly in my opinion, to keep our rain pants dry so we could change into our baselayers and put them on when we got to camp, rather than putting them on now and having two (2!) wet pairs of pants when we got to camp. So, we hiked the most of the six miles to camp, with intermittent moderate rain at times, with wet paints and socks. There was not a whole lot of conversation during the hike, but considerable amounts of hindsight and frustration. Not a great way to start off a backpacking trip, but it comes with the territory. It was during the slog up to the lake where we could camp our first night that I pulled out my camera and realized that I’d forgotten to re-install the battery after charging it. Oops. On the bright side, at least I’d be forced to experience the trip without constantly feeling compelled to take pictures. I take a lot of pictures on my backpacking trips and sometimes ponder whether doing so serves as a distraction or an interruption, if it somehow interferes with my experience of nature. I’ve never really come up with a good answer, although I do know that none of my trips have been spoiled just because I forgot to bring a camera. [Note: all the pictures in this trip report were taken on Justin’s camera, and most of them by Justin]. The hiking was straightforward and steadily uphill, passing from forest to talus slopes to forest as it climbed deeper into the canyon, often paralleling a stream. Some nice views here and there, lovely and fragrant forest, just generally pleasant hiking. After we arrived at the lake where we would spend the first night, changed into baselayers, got comfortable, and sat down to eat dinner, an adventure began to unfold. We chose a flat rock near the lakeshore to eat dinner and it was nearly 10 p.m. before our stoves were brining our water to a boil. On the far side of the lake and slightly uphill we saw what appeared to be the flicker of a headlamp descending toward the lake and the terminus of the official trail. Guess the occupant(s) of the other vehicle at the trailhead wanted to put a full day in or maybe they were camped nearby. We didn’t it much attention and quickly prepared and enjoyed our meal. Once it was pitch black and we noticed that the light remained, blinking in the same place, we began to speculate a bit further. Was it a UFO? A hiker in distress? We couldn’t really come up with any other explanations and it wasn’t for lack of effort. We tried shouting a few times in an attempt to gain more insight into the situation, but given the distance and tumbling streams nearby it probably wasn’t an effective method of communication. We analyzed the situation from every angle we could think of, with some lengthy philosophical digressions occurring regarding hypothetical scenarios, and ultimately decided that we had no choice but to investigate. It looked too much like a blinking headlamp, which might be attached to an injured hiker, for us to ignore it and check it out in the morning. It made sense — hiker gets injured, stays put, puts headlamp on strobe to try and attract attention. Wet socks and boots went back on our feet and we hiked around the lake toward the phantom light. I won’t belabor how difficult it was hiking around the lake with no discernible trail, through a bog, over deadfall, and scrambling uphill through the brush. As a late-night activity, it isn’t one I’d recommend. Imagine our frustration when we arrived at the source of the blinking light — a very official looking post with some type of electronic equipment mounted on it. Fortunately not an injured hiker, but embarrassing — and a bit frustrating — that we had gotten involved in a wild goose chase for over an hour. 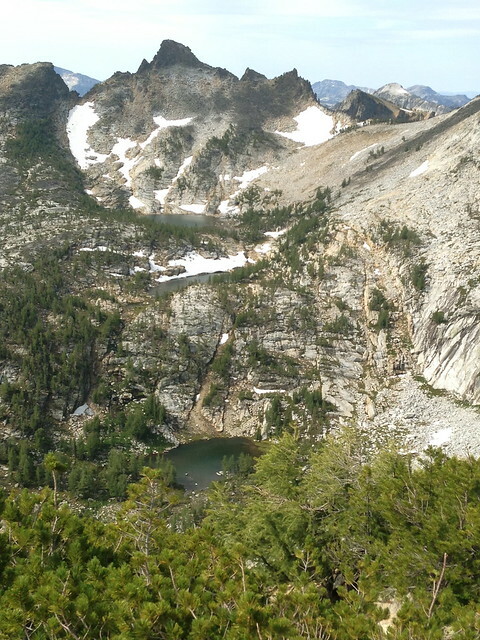 On the bright side, we’d ended up on the south side of the lake and were able to follow a faint trail back to camp. Given the late hour, the stars were absolutely spectacular and we admired them for a few moments before going to sleep. As might be expected, we slept in the following morning and weren’t packed until late morning. We enjoyed a leisurely breakfast by the lakes while our boots, socks and clothes dried in the morning sun. The day ahead wasn’t particularly challenging, just hiking up the canyon to check out the two other lakes and set up camp for the next two nights at whichever one seemed more appealing. 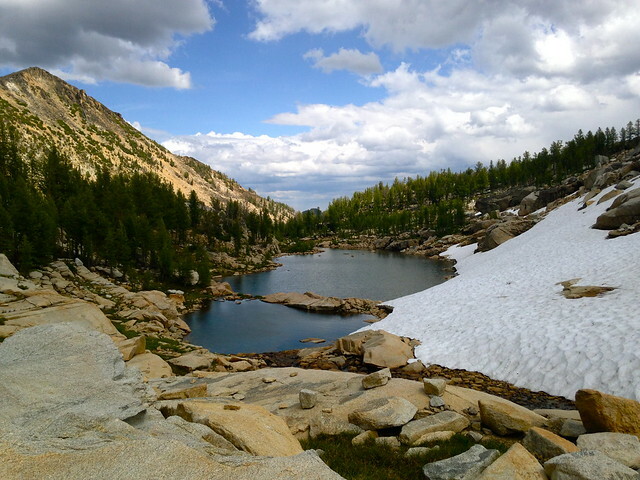 The trail from the first lake to the second was easier to find and follow in the noonday sun, although it was ill-defined and braided in places. From the second lake to the third lake it became more indistinct, but wasn’t too difficult to follow. 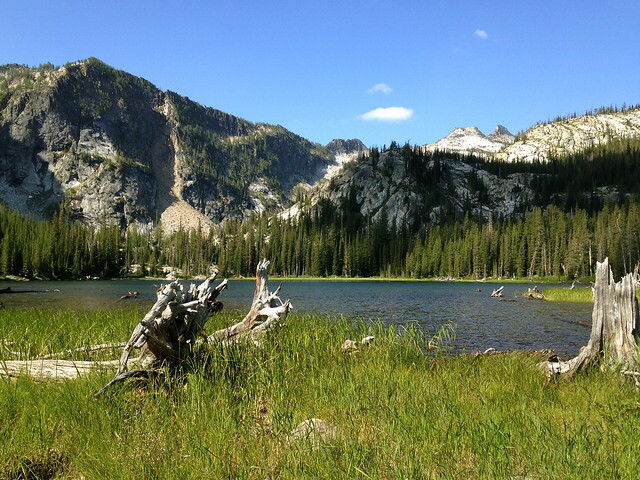 Each lake was impressive and appealing in its own right — either would be a great place to camp at for a few nights. There was a small group camped at the third lake and the only suitable campsite would’ve put us within a stone’s throw of their campsite. Backtracking to the middle lake seemed to be the more polite option, so after taking a few pictures we turned back down the trail. By mid-afternoon we had set up camp near the lake at a cozy spot with a large lakeside slab of rock to lounge around on, our tents tucked into a small grove of trees. 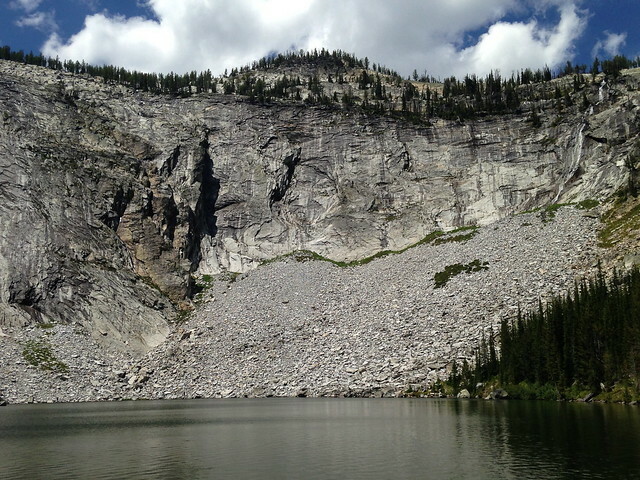 The rock slab was a perfect platform from which to jump into the lake. It was about 8 feet above the cold and crystal clear water, which was perhaps 15-20 feet deep a few feet out. 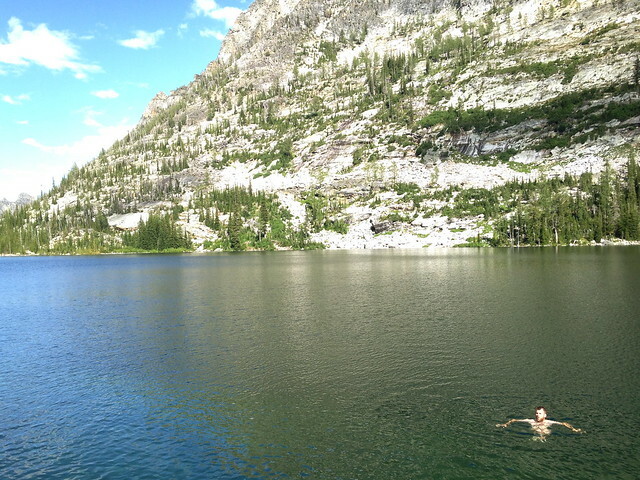 A quick swim led to an easy place to scramble out of the lake and back onto the rock slab. Our afternoon consisted of relaxing on the lakeshore and planning our hike for the next day, which was tentatively a cross-county scramble up to the ridgecrest, summiting a few high points, then back to camp via a route through a chain of small but particularly enchanting alpine and subalpine lakes. Maybe around 5 miles of hiking total, with around 2,500 feet of elevation gain. Nothing too strenuous or technical, but the type of day where you want to get an early start if possible. We headed to bed, alarms set for 6 a.m., just as the light was finally beginning to fade to darkness after the seemingly endless hours of dusk. After eating some snacks, foregoing our usual cups of coffee, and loading up a backpack with the gear we deemed necessary for both comfort and safety, we started the relentless uphill scramble to the ridgecrest. Our route would take us upward via Class 2 and Class 3 scrambling among talus slopes and the occasional rock outcropping. 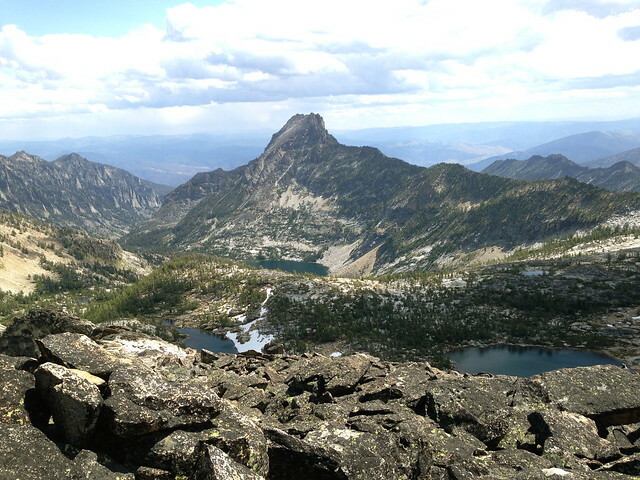 We would reach a distinct high point at 9,883 feet, then roller-coaster along the narrow ridge for perhaps a mile and a quarter, topping out on two other high points, before beginning our descent. The conditions were perfect for this outing and we enjoyed hiking, as well as an extended coffee break to make up for the hurried morning, under blue skies. The route along the ridge was phenomenal. Numerous lakes were visible in the drainages north and south of us, mountains stretched to the westward horizon. The hiking was just challenging enough to keep a person engaged and focused, but without any technical or overly exposed sections. We followed the planned route without any undue difficult and made it back to camp by mid-afternoon where we enjoyed some more swimming and a feeling of accomplishment mixed with supreme awe at the beauty of the landscape we had seen during our hike. Although we were hoping to stargaze after dinner, we weren’t able to resist the lure of sleeping pads and sleeping bags after a day of hiking and headed to our tents just as it was getting dark. We both slept soundly and with no alarm set, rising not too long after dawn to pack up camp and head down the canyon to the trailhead. Aside from losing the trail after the first lake (several user-trails split off and we ended up on the wrong side of the creek), it was a non-eventful hike out.